Located in St. Charles County real estate, homes for sale in Weldon Spring MO are located close to I-70 leading into St. Louis County/City. Weldon Spring Real Estate is made up of both residential and commercial properties and offers numerous dining and shopping options. Weldon Springs MO Real Estate and Weldon Springs MO properties are a perfect addition to the St. Louis Real Estate market. Weldon Spring MO real estate has an average home age of 20 years. Homes for sale in Weldon Spring MO range in price from $150,000 to $2,000,000. The median home price in 2014 was approximately $450,000. Weldon Spring Mo homes are conveniently located right across the Missouri River. The city is bordered by I-40/64, Hwy 94 and the new Page Extension providing quick access to shopping, dining and less than a 30 minute drive to Downtown St. Louis. Weldon Spring properties are served by the Francis Howell School District. See Great Schools for up to date ranking on every school in the area. If you are looking for a home for sale in Weldon Spring MO or you would be interested in buying a home in Weldon Spring, please contact St. Charles real estate expert, Sharon Colona and St. Louis Realty for a professional and simple buying or selling process. Call (636) 397-7653 or email at scolona@stlouisrealty.net. Located in the prestigious Upper Whitmoor Drive, you will find this beautiful blend of exceptional quality, regal details and magnificent finishes. This special estate is situated on 7 private acres with panoramic views of the Missouri River Valley. The artfully designed home and many garages comprises 25,000 square feet of total living space creating a unique opportunity to live in luxury while showcasing fine cars, boats or RVs. Upon entering the grand foyer, you will be greeted by a double sweeping staircase & immense 4,200+ crystal chandelier. The Neff designed kitchen features custom inlaid wood cabinets, granite counters, walk-in butler x2019;s pantry, adjoining breakfast room and hearth room. The master bedroom suite offers enviable views, luxurious bathroom & exquisite custom dressing room. The lower level offers a court for racquetball and basketball, gym & sauna. Commercial 15 person Otis elevator. Geothermal. Whitmoor Country Club has 36 holes of golf & more! Architecturally significant home in prestigious Whitmoor Country Club! Stunning 2-sty marble foyer highlighted by sweeping staircase leads to elegant dining room & library-paneled study with bookcases & French doors to terrace. Architectural columns, elaborate limestone mantle & palladian windows set the tone for the 2-sty great room. Chef x2019;s kitchen featuring commercial grade appliances, granite countertops & butler x2019;s pantry adjoins breakfast room with wide bay window & coffered hearth room with stone fireplace. Sumptuous master bedroom suite combines the enjoyment of a marble fireplace with dressing room, 2 expansive closets & lavish bath. Elevator access to 5 additional ensuite bedrooms & bonus room plus Lower Level entertainment space with recreation room, media room (equipped with virtual golf), gathering bar, billiards room & Amerec spa. The outdoor living area features veranda with fireplace, pool & hot tub. Impeccably landscaped 3.3 ac grounds with porte cochere & 6-car garage. Exquisite Johnson-built Estate home on 3-ac grounds! Over 9000 sf of living space enhanced by distinctive architectural elements throughout. 2-Sty hardwood foyer leads to elegant dining room & spectacular great room with wet bar, marble fireplace, built-in bookcases & expansive windows with private wooded views. Designer kitchen with 42 x201D; cherry cabinetry, granite countertops, commercial grade appliances & butler x2019;s pantry adjoins sunlit breakfast room with breakfront & vaulted hearth room highlighted by stone fireplace. Coffered master bedroom suite with marble bath with Jacuzzi & adjacent study offers an appealing retreat. Golf room features wet bar, putting green & cart storage. Front & rear staircases access 3 additional bedrooms, 2 with Jack n x2019; Jill bath & 1 with ensuite bath. Lower Level includes recreation room, billiard room, media room, game room & 1 xBD; baths. Situated on a premium cul-de-sac lot with deck, patio, fire pit & wooded walking paths plus porte cochere & 3-car garage. Spectacular 1.5-sty Southern Colonial on 2.3-acre grounds! Homearama showhouse with over 7400 sf of living space enhanced by wide plank pine flooring, millwork, skylights & arched entryways. 2-Sty foyer leads to elegant dining room & vaulted great room with fireplace, bookcases & wall of windows with private wooded views. Chef x2019;s kitchen with granite countertops, commercial grade appliances & 7 x2019; center island adjoins breakfast room with custom built-ins & hearth room with beamed cathedral ceiling & fireplace. Sumptuous master bedroom suite with marble bath & sitting room with cast stone fireplace provides an appealing retreat. Broad hardwood staircase accesses 3 additional bedrooms, 1 with ensuite bath & 2 with Jack n x2019; Jill bath, plus bonus room, workout room & 2nd laundry. Walk-out Lower Level features recreation room, gathering bar, wine cellar, guest suite & xBD; bath. Outdoor entertaining area includes pool & spa surrounded by landscaped gardens, patio with grilling station & fire pit. Stunning TBB inventory home by Graystone Homes. This is one of 5 custom ranch, 1.5 story and 2 story designs ranging from 2400 to over 4835 sq ft. This top selling 1.5 story is a 4 BD, 4 BA with 3285 sq ft. of beautiful living space. Standard features include all brick & stone front elevations, side entry garages, granite counter tops, 42 x201D; cabinets, 9 x2019; ceilings, gas FP, hardwood floors, Anderson windows, W/I closets, arch shingles, Prof. design assistance and more. This 1 acre private setting offers easy access to Hwys 364, 94, 64/40, Chesterfield Valley and is located in the desirable AAA rated Francis Howell SD. Pictures are of home built by Graystone Homes in Kirkwood. PLEASE SEE SUPPLEMENTS FOR FLOOR PLANS. Simply outstanding home nested on a lot with exquisite view of the golf course, lake and your own private inground pool. Stunning fully remodeled gourmet kitchen of your dreams - rich wood flooring, gas cook top with custom hood, large center island - breathtaking. The neutral color palette will allow you to step right in and be at home. The spacious home office plus formal dining room with gleaming wood floors and elegant chandelier greet you and invite you to the fantastic great room with soaring ceilings and a GORGEOUS VIEW that will cause you to stop and sit down and enjoy. Mud room offers a cubby style organization system. Enjoy coffee in the sunroom or screened porch. Master suite with spa-like bath. Adorable 2nd bedroom on-suite. Wonderful builder finished lower level that includes 2 bedrooms, family room with fireplace, home gym - with beverage center. Billiard room with fireplace - great entertaining home. The details and upgrades are remarkable. Country Club Community. Stunning inventory home by Graystone Custom Homes. This top selling Ranch has 4 BD, 4 BA, 3,570 s/f of beautiful living space on a .35 acre lot. The elev is exquisite w/brick and stone, arch entry, arch shingles, upgraded front door & 3 car garage w/added work shop. Features inc 9 x2019; ceilings, Grt Rm with, gas FP w/stone or marble hearth and face. Deluxe Kit w/island, granite countertops, Whirlpool Stainless Steel appliances, custom cabinets, stone tile b/splash, W/I pantry, hardwood flrs, 5.25 base trim, wrought iron balusters. W/I master closet, jack-jill bath, 12 x2019; X 12 x2019; Patio & more. This private setting offers easy access to Hwys 364, 94, 64/40, Chesterfield Valley and is located in the desirable AAA-rated Fr Howell School Dist. Absolutely beautiful 1.5 story Atrium, 3/4 acre lot in desired Southbrook Forest. 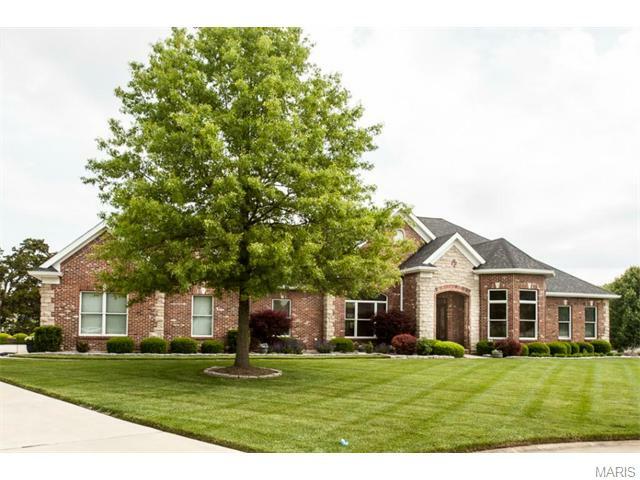 Approx 5,000 sqft of total living space, 4 beds, 5 baths which include 2 master suites! Many updates throughout this spacious home! The 2-sty Great Room with wall of Palladian windows offers an abundance of natural light. Newer flooring throughout most of the main level, gas fireplace, mantle, built-in display shelves, arched doorways, UPDATED kitchen opens to the hearth room w/2nd gas fireplace, plantation shutters, granite counters w/functional overhang, paneled refrigerator, 42 cabinets, newer SS appliances, gas cook top range. Dining w/double tray ceiling, bay window, plantation shutters. MF master suite, coffered ceiling, bay window, luxury bath, dual sink vanity, walk-in closet! Loft w/newer flooring, balcony overlooks great room. Finished LL, w/half bath, wet-bar, rec room, 2nd master w/full bath. Backyard offers walkways, patios, 2 story newer decks (2018). Easy access to HWYS 40, 364, 141 & 70! Ehlmann Farms by Fischer and Frichtel offers just 10 gorgeous home sites ranging from xBD; acre to nearly a full acre in size in an amazing location! This private setting offers easy access to Hwys 364, 94, 64/40, Chesterfield Valley and is located in the desirable AAA-rated Francis Howell School Dist. Offering single family homes from the Estate Collection, these executive homes inc high end finishes, 3 car side entry garages, distinctive brick-stone elevations, James Hardie fiber cement siding, deluxe Kitchens w/granite countertops, designer cabinetry, hardwood flooring, luxurious Mstr retreats w/spa like baths & more. The Westbrooke is a spectacular 4 BD, 3.5 BA, 4,109 sq ft 1.5 story w/a MAIN FLOOR MSTR. A prof design consultant will assist in designing your dream home to reflect your individual tastes and needs. There are W/O and in-grade home-sites to choose from, some of which back to a large common ground area. Build to your specifications in this outstanding St. Charles location! Ehlmann Farms by Fischer and Frichtel offers just 10 gorgeous home sites ranging from xBD; acre to nearly a full acre in size in an amazing location! This private setting offers easy access to Hwys 364, 94, 64/40, Chesterfield Valley & is located in the desirable AAA-rated Francis Howell School Dist. Offering single family homes from the elegant Estate Collection, these executive homes inc high end finishes, 3 car side entry garages, distinctive brick-stone elevations, James Hardie fiber cement siding, deluxe Kitchens w/granite countertops, designer cabinetry, hardwood flooring, luxurious Mstr retreats w/spa like baths and more. The Parkview II is a 4 BD, 3.5 BA, 3,840 sq ft, 1.5 story w/a MAIN FLOOR MSTR SUITE. A prof design consultant will assist in designing your dream home to reflect your individual tastes & needs. There are W/O & in-grade home-sites to choose from, some of which back to a large common ground area. Build to your specifications in this outstanding St. Charles location! Ehlmann Farms by Fischer and Frichtel offers just 10 gorgeous home sites ranging from xBD; acre to nearly a full acre in size in an amazing location! This private setting offers easy access to Hwys 364, 94, 64/40, Chesterfield Valley and is located in the desirable AAA-rated Francis Howell School Dist. Offering single family homes from the elegant Estate Collection, these executive homes inc high end finishes, 3 car side entry garages, distinctive brick-stone elevations, James Hardie fiber cement siding, deluxe Kitchens w/granite countertops, designer cabinetry, hardwood flooring, luxurious Master retreats w/spa like baths and more. The Nantucket is a 3 BD, 2.5 BA, 3,292 sq ft ranch w/a Hearth Rm. A professional design consultant will assist in designing your dream home to reflect your individual tastes and needs. There are W/O and in-grade home-sites to choose from, some of which back to a large common ground area. Build to your specifications in this outstanding St. Charles location! Ehlmann Farms by Fischer and Frichtel offers just 10 gorgeous home sites ranging from xBD; acre to nearly a full acre in size in an amazing location! This private setting offers easy access to Hwys 364, 94, 64/40, Chesterfield Valley and is located in the desirable AAA-rated Francis Howell School Dist. Offering single family homes from the Estate Collection, these executive homes inc high end finishes, 3 car side entry garages, distinctive brick-stone elevations, James Hardie fiber cement siding, deluxe Kitchens w/granite countertops, designer cabinetry, hardwood flooring, luxurious Mstr retreats w/spa like baths & more. The Wyndham is a stunning, 4 BD, 3.5 BA, 3,752 sq ft, 1.5 story w/a MAIN FLOOR MSTR SUITE. A prof design consultant will assist in designing your dream home to reflect your individual tastes & needs. There are W/O and in-grade home-sites to choose from, some of which back to a large common ground area. Build to your specifications in this outstanding St. Charles location! ***BACK ON MARKET DURING ROAD CONTRUCTION*** Built on over an acre of flat land this 2-story home with salt water in-ground pool has it all. Relax on the deck by the low maintenance inground pool. Enter into a soaring ceiling in the foyer, split staircase that leads to the upper level with 3 bedrooms all with walk-in closets. The massive master suite has a coffered ceiling, a sitting area, a luxury bath with separate shower and tub, double vanities and two walk-ins. There is a separate formal dining room and formal living room/office/den with French double doors and both have coffered ceiling. And if a cozy fireplace in the family room is not enough it has a hearth room with cathedral ceilings on the main floor. This custom home has all the bells and whistles with a central vacuum system, security system and intercom system. A home like this in the sought after Camelot Subdivision with walking trails and City park just across the street will not last long. MUST SEE TO APPRECIATE. Picturesque 1.5 Sty w/5Bdrm & 4.5Bth on just under xBD; acre corner lot! From the moment you walk in- WOW! The Floorplan you have been waiting for! Plantation Shutters, Gleaming Hardwood floors, Professional landscaping w/lighting, Private treelined back yard x2026;New roof( x2019;16) Great Rm w/11 ft ceilings, wall of windows, fireplace & built-in bookcases. Designer Kitchen w/ granite counters, double ovens, walk-in pantry open to Vaulted gathering/sunroom. The Office could be used as the 5th Bdrm. MAIN FLOOR MASTER w/large walk in closet & luxury Master Bath w/double vanities & jet tub. Family Foyer- Powder Rm, Mud Rm & Laundry Room just off the 3-car garage. Upstairs offer Loft/Game room, as well as 3 generously sized Bedrooms, each w/walk-in closet & full Bath. LL/ rough-in, zoned HVAC, two 50gal water heaters, sump pumps, & lots of storage. Relax outside on the patio & enjoy the professionally landscaped yard w/lighting. THIS IS IT! Ehlmann Farms by Fischer and Frichtel offers just 10 gorgeous home sites ranging from xBD; acre to nearly a full acre in size in an amazing location! This private setting offers easy access to Hwys 364, 94, 64/40, Chesterfield Valley and is located in the desirable AAA-rated Francis Howell School Dist. Offering single family homes from the elegant Estate Collection, these executive homes inc high end finishes, 3 car side entry garages, distinctive brick-stone elevations, James Hardie fiber cement siding, deluxe Kitchens w/granite countertops, designer cabinetry, hardwood flooring, luxurious Master retreats w/spa like baths and more. The Waterford is a stunning, 4 BD, 2.5, BA, 3,612 sq ft two story. A professional design consultant will assist in designing your dream home to reflect your individual tastes and needs. There are W/O and in-grade home-sites to choose from, some of which back to a large common ground area. Build to your specifications in this outstanding St. Charles location! If living in a golf community is your dream-here is your chance! This gracious 2 story home overlooks the 7th hole in the prestigious Whitmoor Country Club. Situated on a quiet cul-de-sac offering-formal dining/living rm, spacious fam rm boasting a gas F/P, wet bar that flows to a bright brkfst area & kit w/granite counters, soaring vaulted ceiling w/skylight, center island & more. Second flr hosts a huge master bdrm and luxurious en-suite bath w/sep shower, lg tub & gorgeous double vanity. Secondary bdrms are large & bright. Additionally, a designated office. Finished LL is huge, w/rec area, add sleep area, & 3rd full bath w/loads of storage. Features are endless-hardwoods throughout main fl, special millwork, arched doorways, MFL, elegant T-staircase and 2 story entry foyer, & covered patio oasis. Updates include-siding 13, interior lighting '14, hardware '14, Bosch dishwasher '17, Pella windows '15, maintenance free deck & facia '18, and Carrier HVAC/Aprilaire Steam Humidifier '18. Ehlmann Farms by Fischer and Frichtel offers just 10 gorgeous home sites ranging from xBD; acre to nearly a full acre in size in an amazing location! This private setting offers easy access to Hwys 364, 94, 64/40, Chesterfield Valley and is located in the desirable AAA-rated Francis Howell School Dist. Offering single family homes from the elegant Estate Collection, these executive homes inc high end finishes, 3 car side entry garages, distinctive brick-stone elevations, James Hardie fiber cement siding, deluxe Kitchens w/granite countertops, designer cabinetry, hardwood flooring, luxurious Master retreats w/spa like baths and more. The Nantucket II is a 3 BD, 2 BA, 2,797 sq ft ranch w/a Hearth Rm. A professional design consultant will assist in designing your dream home to reflect your individual tastes and needs. There are W/O and in-grade home-sites to choose from, some of which back to a large common ground area. Build to your specifications in this outstanding St. Charles location! Ehlmann Farms by Fischer and Frichtel offers just 10 gorgeous home sites ranging from xBD; acre to nearly a full acre in size in an amazing location! This private setting offers easy access to Hwys 364, 94, 64/40, Chesterfield Valley and is located in the desirable AAA-rated Francis Howell School Dist. Offering single family homes from the elegant Estate Collection, these executive homes inc high end finishes, 3 car side entry garages, distinctive brick-stone elevations, James Hardie fiber cement siding, deluxe Kitchens w/granite countertops, designer cabinetry, hardwood flooring, luxurious Mstr retreats w/spa like baths and more. The popular Arlington II is a spacious, 2,653 sq ft, 3 BD, 2 BA ranch. A professional design consultant will assist in designing your dream home to reflect your individual tastes and needs. There are W/O and in-grade home-sites to choose from, some of which back to a large common ground area. Build to your specifications in this outstanding St. Charles location! Ehlmann Farms by Fischer and Frichtel offers just 10 gorgeous home sites ranging from xBD; acre to nearly a full acre in size in an amazing location! This private setting offers easy access to Hwys 364, 94, 64/40, Chesterfield Valley and is located in the desirable AAA-rated Francis Howell School Dist. Offering single family homes from the elegant Estate Collection, these executive homes inc high end finishes, 3 car side entry garages, distinctive brick-stone elevations, James Hardie fiber cement siding, deluxe Kitchens w/granite countertops, designer cabinetry, hardwood flooring, luxurious Master retreats w/spa like baths and more. The Woodside is a 3 bdr, 2 bath, 2,662 sq ft, split bdr ranch. A professional design consultant will assist in designing your dream home to reflect your individual tastes and needs. There are W/O and in-grade home-sites to choose from, some of which back to a large common ground area. Build to your specifications in this outstanding St. Charles location! Ehlmann Farms by Fischer and Frichtel offers just 10 gorgeous home sites ranging from xBD; acre to nearly a full acre in size in an amazing location! This private setting offers easy access to Hwys 364, 94, 64/40, Chesterfield Valley and is located in the desirable AAA-rated Francis Howell School Dist. Offering single family homes from the elegant Estate Collection, these executive homes inc high end finishes, 3 car side entry garages, distinctive brick-stone elevations, James Hardie fiber cement siding, deluxe Kitchens w/granite countertops, designer cabinetry, hardwood flooring, luxurious Master retreats w/spa like baths and more. The Durham II is a spacious, open, 2,220 sq ft, 3 BD, 2 BA ranch. A professional design consultant will assist in designing your dream home to reflect your individual tastes and needs. There are W/O and in-grade home-sites to choose from, some of which back to a large common ground area. Build to your specifications in this outstanding St. Charles location!